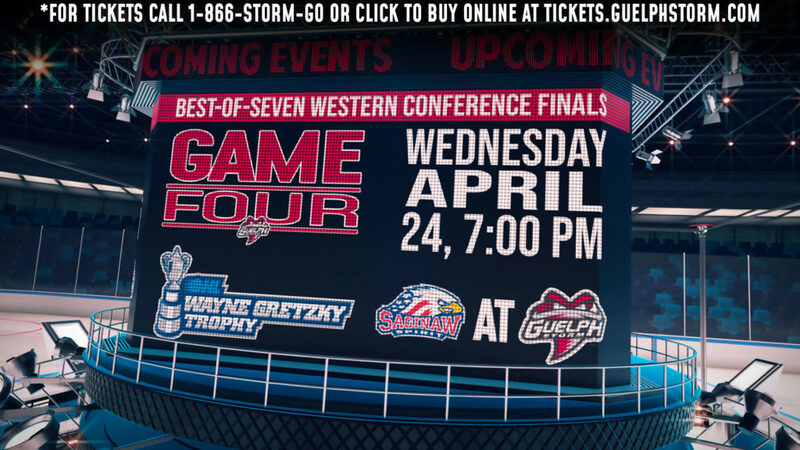 The Storm face off against the Owen Sound Attack tonight at home for the second time this season. Game time is 7:30pm. Riding a four game winning streak heading into tonight, the Storm placed 9th in the CHL’s Top 10 Rankings this week, the first time they’ve ranked since the 2013-14 season. Defeating the Attack 6-2 during the first meeting of the season, captain Isaac Ratcliffe scored twice while rookies Daniil Chayka and Ty Collins scored their first OHL goal in the game. The Storm are currently undefeated in their last four outings, outscoring their opponents 24-14 since the return of Ryan Merkley on the blueline. Owen Sound (3-4-0-0) have been outscored 27-20 in their first seven games of the season, and will be looking to take control of their goal differential going into Friday’s game. The Attack are ranked 17th on the Penalty Kill and ranked 9th on the Power Play thus far, and are the 5th ranked team in total penalty minutes. The Attack have some firepower upfront with Kevin Hancock (4G, 3A), Nick Suzuki (3G, 4A) and Alan Lyszczarczyk (3G, 3A), while NHL draftee Sean Durzi is back on the blueline for Owen Sound. 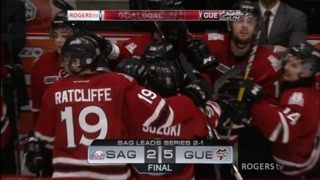 After Guelph started the season 0-1-1-0, they have won four straight games while scoring 6 goals in each of those games. The Storm have the league’s best power play currently operating at 38.1%. A big reason for their success with the man advantage has been the return of Ryan Merkley, who has added 4 power play assists since coming back from development camp in San Jose (NHL). Guelph’s top line of Nate Schnarr (5G, 7A), Isaac Ratcliffe (6G, 4A) and Liam Hawel (4G, 6A) have been almost unstoppable over their four-game win streak and they’re all ranked in the league’s top 20 in points to start the season. While NHL 1st round draftee Ryan Merkley has added six assists in the four games he’s played this season on the blueline. This game will feature 13 players that have been drafted to the NHL. 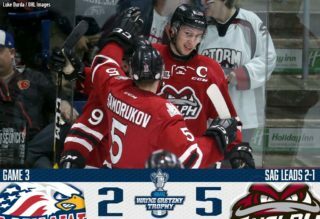 The Guelph Storm have seven NHL drafted players that include Ryan Merkley (SJ – 1st Round), Cam Hillis (MTL, 3rd Round), Isaac Ratcliffe (PHI, 2nd Round), Nate Schnarr (ARI, 3rd Round), Dimitri Samorukov (EDM 3rd Round), Liam Hawel (DAL – 4th Round) and Alexey Toropchenko (STL – 4th Round). Owen Sound has six players that have been drafted to the NHL including Sean Durzi (TOR – 2nd Round), Trenton Bourque (STL – 6th Round), Markus Philips (LA – 4th Round), Nick Suzuki (VGK – 1st Round – Traded to MTL), Aidan Dudas (LA – 4th Round), Maksim Sushko (PHI – 4th Round). 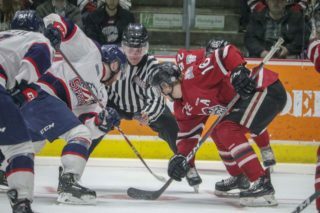 Owen Sound defenceman Sean Durzi was drafted by the Toronto Maple Leafs in the 2018 NHL draft and is looking to contribute at a high level for the Attack this season. Last year, Durzi operated above a point per game level, and had a great playoff adding four goals and 12 assists in 11 games played during Owen Sounds playoff run. 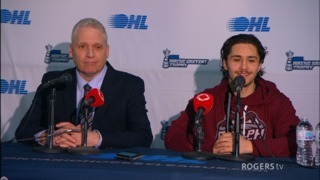 The Storm acquired Domenico Commisso from The Oshawa Generals late last week. The overager has accumulated two assists in the two Storm games he’s played since coming over. As an overager, Domenico will be looked upon to add scoring depth to the Guelph lineup after he put up nearly a point per game in the last 2 full seasons for The Generals. The Storm head to Sarnia tomorrow for a 7:05pm start before returning to the Sleeman Centre to take on division rival London Knights on Sunday for our first annual First Responders Game. Puck drop is 2:00pm.